We’ve all seen the video of Banksy attempting to hang his own work in The Metropolitan Museum of Art, MoMA, and other major museums. Is this a gag? A stunt? Is he the shock jock of street art? Perhaps. But one question he is asking loudly and clearly is, who’s to dub one work museum worthy and one not? A major criticism in the art world will always be the commercialization of galleries. To the frustration of many talented up and coming artists, these large quiet spaces often come under fire for catering to the wealthy, specifically showing what’s “trendy” over what’s “good,” or art they think might fit in a loft in TriBeCa. What if these bounds were broken, and there was no emphasis on how “good” an artist is based on where their work is shown. What if all types of artists could have shows in notable places? What if you could hang your artwork at next to Van Gogh’s “Starry Night” at MOMA, in the trees at Central Park, or even in the Roman Colosseum? 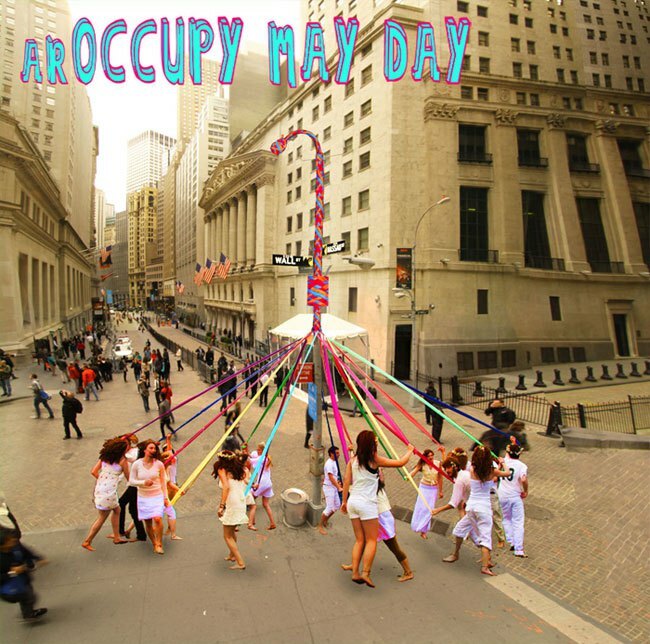 Bushwick based Artist Mark Skwarek may have found a way. When you think “augmented reality” it’s easy to picture holograms of Michael Jackson and Marilyn Monroe singing next to this year’s American Idol winner. But Skwarek has been exploring how the medium can change the way we think about art since the 1990s. By working with artists who are willing to submit their work to basically, thin air -- Skwarek creates art galleries that exist in virtual space. By searching “BOS” on site in a free app called “Layar” in specific parts of the city, a viewer can see works that he has specifically placed, in the sky, hanging on buildings, in different venues, etc. “We said [to artists] if you want to send us your artwork, we’ll make a show, we’ll put your work in MoMA, you’ll have a show in MoMA. What came out of that show was not so much about the DIY element, but it was about breaking and questioning the boundaries of one of the most prestigious institutions and the entire gallery system.” Hundreds of people can be seen enjoying the new possibilities that augmented reality can bring to viewing art in such a prestigious and traditional institution. It’s clear that the possibilities for a relationship with augmented reality and traditional art are just about endless. “We’ve put stuff in the White House, we’ve put stuff at the Korean DMZ, I’ve put stuff at the Palestinian Israeli separation barrier. Recently we just removed all of the parthenon marbles from the British museum and returned them to Greece. It has a lot of freedom and you can do big things,” Skwarek reiterated. 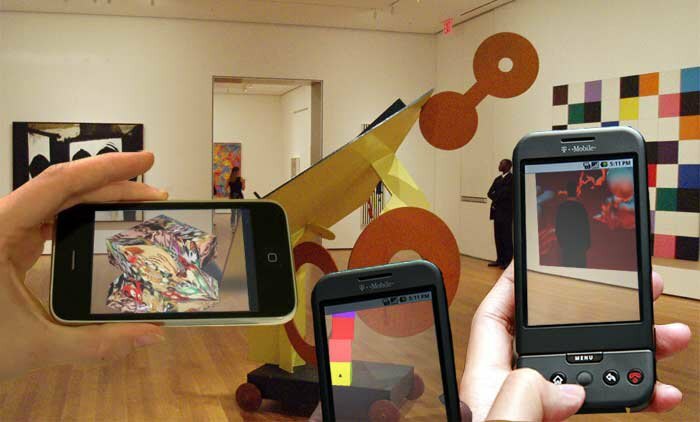 But the one place on earth that has possibly the highest concentration of art in augmented reality? Bushwick. 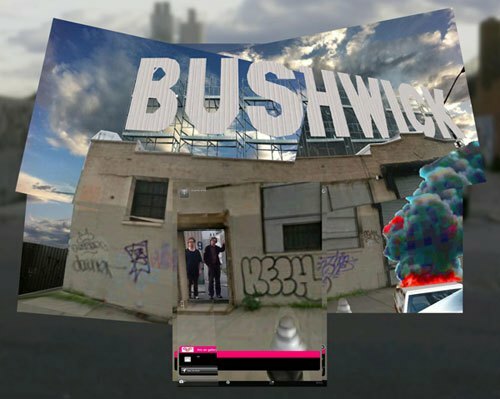 Bushwick appears to be a playground and an experimental space for Skwarek and his friends, and one of the most supportive communities for this type of work. Because it seems so steeped in technology, it does beg the question: Should this be classified as art? In addition to both playing with the laws of physics, and challenging the boundaries of art institutions, the project encourages people to get up and get out. While most art and technology platforms make it easier for viewers to never have to actually go to Paris to see the Louvre, (ahem, Google Art Project), one needs to physically be in these spaces to see the work. The art world will always be in contempt about technology “invading” “traditional” forms of art. But one thing that can’t be argued with is Skwarek’s work in Bushwick is that makes the art world more accessible for artists and art lovers alike, knocking down the barriers that stand in the way of bringing all types of great art to people all over the world.